i think that if you know me at all or have been following my twitter long enough, you know that i love holidays. you know that i am a sucker for holiday traditions and for all the candy and foods (no surprise there!) that come with them. and Easter is no exception, especially when it comes to all that yummy Easter candy goodness. but the holiday means so much more to me than all of that. it's when i reflect on what my Lord and Savior, Jesus did...when He died on the cross, was buried and then rose from the dead. today i celebrate that because of Christ, i can truly live. like Peter, i marvel and continue to marvel at what happened. yes! He is Risen, He is Risen indeed! happy easter and enjoy this most glorious day my friend! Today is definitely a most beautiful and spiritual day! Happy Easter! beautiful post, friend! hope you have a blessed day with your friends and family! 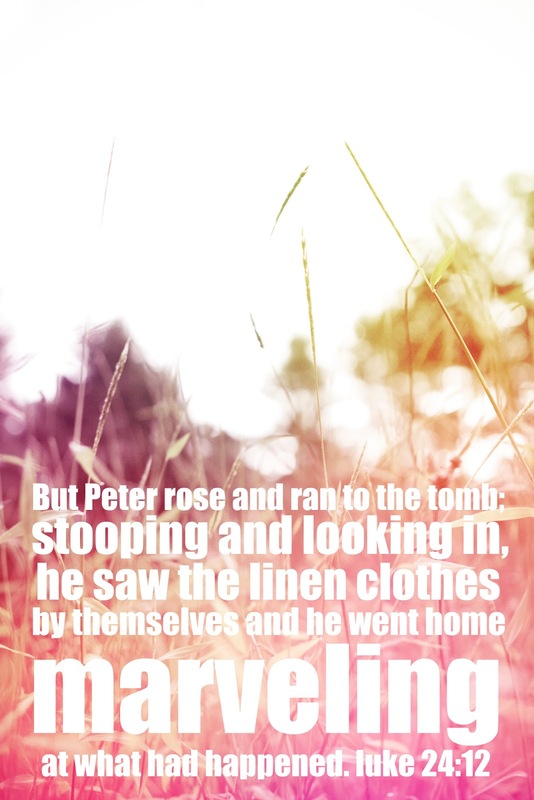 I love that verse... just beautiful :) Happy easter to you and yours! great blog! I like your layout!